Win32Easy - Win32 API easy explained! : Using a dialog - Using buttons & co. Using a dialog - Using buttons & co. This article continues where the first article about dialogs ended. If you didn't read that so far you can do it here. Depending on the free editor you are using you maybe need to convert the source code a bit or move files. For example ResEdit creates a resource.h but you need to move it to your projects folder first. 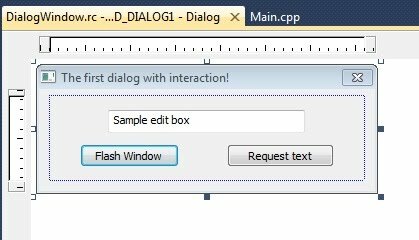 In the article linked above we have seen how we can show and destroy a dialog using a resource inside the executable and the function DialogBox. Now we want to let the user interact with controls on the dialog. In this example we will make a dialog that has a two buttons and an edit box where the user can enter text. This name will be important later. 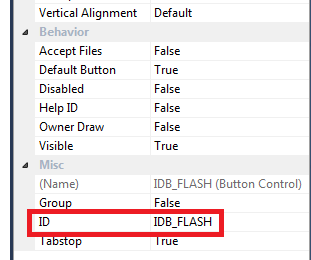 The Request text button has the ID IDB_REQTEXT and the edit control is named IDC_EDIT1. Thats all for the design. Now we can switch back to the code! As all logic will be performed inside the DialogProc function so long all variables will be static ones inside that function. To retrieve handles (accessors) for the controls windows exposes the function GetDlgItem (which means "get item inside dialog") which searches all controls and looks if it matches the given ID. The usage of GetDlgItem is very simple. The first parameter is the dialog that should be searched and the second parameter is the ID (see above) of the control to search. We are searching the codes as soon as the dialog is ready which is inside WM_INITDIALOG. We also check if we could get handles to all controls we need and if not we sadly need to terminate the application because they are essential! // We need to include the terminating 0, GetWindowTextLength does not count it! There is one other important thing to say about WM_COMMAND. The high word of wParam which specifies the notification code is not different for every single type of notification that exists. Its only unique for each type of control. For example BN_CLICKED is defined as 0. There are other types of controls which also have the notification code defined which not really means that they were clicked. So always take the type of control that sent the notification into account, thats very important!